On November 9 the Consumer Technology Association (CTA) reported that Holiday (Q4) shipments of 4K UHD televisions in the United States are expected to reach 4.5 million units, driving total 4K UHD sales for 2016 to 10 million units – a 40% increase in sales over last year. LG Commercial Displays sees this as great news for 4K digital signage, too. Why? Because as 4K TVs become more popular, so will the demand for 4K content. And that means much more potential for businesses looking to give their customers an incredible onsite experience with attention-grabbing branding elements, intricate product details, enhanced communication and better engagement, courtesy of larger displays with outstanding 4K UHD resolution. At LG, raising the bar on image quality and the customer experience is our top priority. Our end users have known it for years from our 720P and Full HD panels with IPS technology, 4K UHD displays and video walls with advanced local dimming and Shine Out™ technology, and now our latest and greatest, LG OLED, setting the new standard for the pinnacle of image quality and innovation. Last week we told you about the advantages of large 4K displays for business. And after the recent report from CTA, we especially want to encourage you, whether you’re currently considering a 4K UHD display solution, on the fence, or still not convinced. If you want to raise the bar on your customer environment, large 4K displays with their immersive viewing experience would indeed be the way to go. And don’t forget, LG 4K displays feature our Tru 4K Upscaler to make the most of non-4K content. So the same content you’ve already been using on your digital displays will look even better, even when your patrons get up close. Read the full Consumer Technology Association press release here. More businesses are installing large 4K displays. Here’s why. Large 4K Ultra-High-Definition (UHD) displays present a huge opportunity for businesses that are looking to elevate their brand image, add wow factor to their messaging and create an exciting customer experience. With incredibly detailed images, stunningly bright colors and jaw-dropping sizes, large 4K displays could be exactly what you need to create an unforgettable environment for your patrons. The larger the display, and the closer visitors can get to it, the more important it is to have 4K capability. Higher resolutions mean that the image has more detail, so with 4K’s 8.29 million pixels (3840 columns and 2160 rows of pixels) compared to Full HD 1080p’s 2.07 million (1920 columns and 1080 rows of pixels), 4K displays are able to show greater details that become very noticeable on larger screens. Visitors will see the difference in important branding elements, product representations, smoother lines and other aesthetics. A 4K display also makes it possible for customers to get quite close to a big screen without noticing the pixels that make up the image. With a 98-inch Full HD 1080p display, for example, people would need to be at least 13 feet away before the pixels would disappear. But with a 98-inch 4K display they could be as close as seven feet. So with 4K, you could have a much larger display, even a massive video wall, in a smaller space without hindering the amazing visual experience. And then there’s 4K’s extreme color gamut. 4K UHD panels are Rec. 2020 color space compliant, providing a much wider range of colors than a Full HD panel’s ITU709 color space. 4K UHD are able to reproduce colors that cannot be shown with the ITU709 color space and, therefore, can more faithfully reproduce branding and product colors. It’s important to note that it’s not enough to simply purchase a 4K display if you want to view native 4K content. Your entire content chain will need to support 4K video. Products designed for use with native 4K content must also support HEVC (High Efficiency Video Coding), the new H.265 encoding/decoding standard, which compresses 4K video signals so they don’t overwhelm the network. Also keep in mind that simply streaming Full HD 1080p, 720p or standard definition content to a 4K display will result in graphics that are either way too small, or expanded and distorted. Non-4K content needs to be prepared for a 4K screen via a process called upscaling. LG’s Tru Upscaler function is state-of-the-art, delivering UHD image quality with the lower resolutions. The same content a business has already been using on their existing digital displays will look even better on an LG 4K commercial display, even when viewed from up close. Large 4K displays are a powerful strategy for capturing and holding customer attention and maximizing your message’s impact. Your customers won’t soon forget the extra effort you put in to give them a breathtaking show. We’re working on a 4K eBook that will give you plenty of details about LG’s 4K display advantages. Stay tuned and we’ll tell you when it’s ready. The popularity of digital signage continues to increase, and today it has become the standard wherever people shop, eat, gather and work. Yet many small to medium size businesses do not have the time, expertise or capital to evaluate technologies, hunt for multiple vendors and coordinate an end-to-end digital signage deployment. And so they are looking for a digital signage partner who can provide all of the necessary components rather than having to do all the legwork themselves. They want a digital signage solution that can be easily purchased and works well. Here’s some great news for SMBs: Freshwater Digital in Grand Rapids, Michigan, now offers a very budget-friendly complete digital signage solution with LG commercial displays at the heart. They call it FreshSign. For $125 per month, end users get a turnkey package that includes an LG 49-inch 1080p commercial display, industrial mount, professional installation, full-featured software, customizable content, content management support and personal customer support, all from Freshwater Digital. In the FreshSign package the LG digital signage runs on LG’s webOS, along with software from Gauddi—the world’s first digital signage platform dedicated to LG webOS. The LG displays with robust System-on-a-Chip (SoC) also eliminate the need for an external media player, allowing for the great pricing. FreshSign is also available with a 43-inch LG display for $120 per month, or a 55-inch LG display for $140 per month. This is going to make a lot of business owners very happy. LG is very pleased to be part of this exciting and efficient solution that will bring the power of digital signage into many more SMBs. Learn more about the FreshSign complete digital signage solution with LG displays here. FreshSign™ is a trademark of Freshwater Digital. October 24 – 28 was Digital Signage Week in New York City, bringing together industry leaders, media owners and planners, creative agencies, retailers, architects and investors, all looking to experience the latest and greatest digital signage has to offer. LG was there on October 27, and we did not disappoint. We took over 404 Studios in Midtown Manhattan with an amazing all-day display of the cutting edge. During breakfast and lunch sessions jaws dropped at the sight of our incredible In-Glass OLED Wallpaper, Dual-Sided Curved Tiling and Flat OLED Displays, 55-inch OLED Hospitality TV, and the 86-inch Ultra Stretch Signage in a freestanding four-sided pillar configuration. 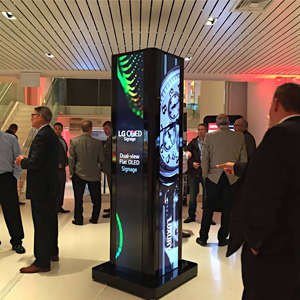 Large-format displays and the Clover Video Wall drew plenty of attention too. IT professionals were impressed with our UltraWide® Monitors and smaller desktop monitors, and Hospitality guests marveled at the perfect amenity for a standout hotel—the LG Styler steam care system for clothing. All along one side of the studio were the outstanding LG Signature home appliances and award-winning Signature OLED TV G6. And one lucky registered attendee won a 55-inch curved OLED TV. Congratulations! Then at 4:00 p.m. the lights went down and the music turned up. We transformed 404 Studios into a club-like ambience as our Life’s Good Lounge with guest DJ, open bars and passed Hors d’oeuvres gave our guests a fun place to relax, unwind and network for four more hours. We have plenty of the NYC photos for your viewing pleasure here, and we’ll have videos up next week. A big THANK YOU to all our guests for making this event a huge success. Today, November 3, we’re in Miami for a Commercial Display Roadshow aboard the SeaFair Miami—the world’s first megayacht event venue. It’s the fourth largest private yacht in America, stretching 228 feet long and towering 57 feet above the water. Stay tuned for info, photos and video.